SPOKANE, WASH -- The issue of breaching four giant dams on the Snake River to help endangered salmon runs has percolated in the Northwest for decades, but the idea has gained new momentum. 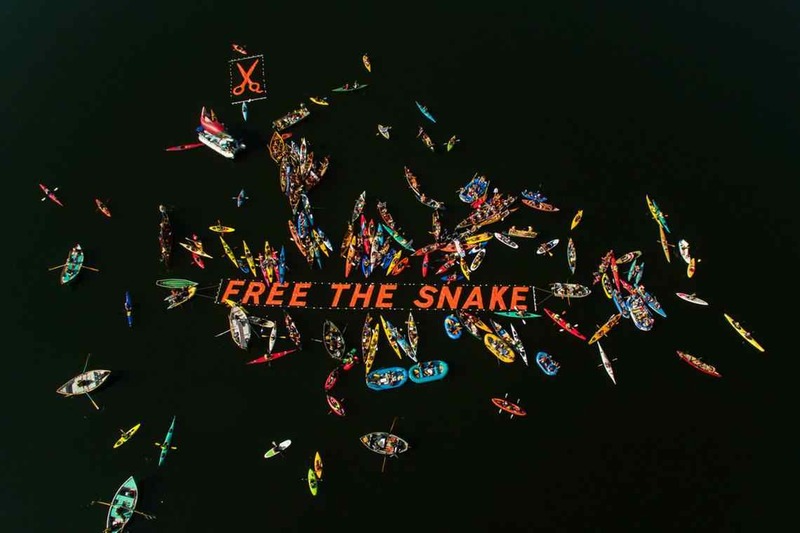 Following renewed political pressure to remove the dams, people who oppose the structures gathered Oct. 3 on the Snake River in up to 200 boats. They unfurled a giant banner that said, "Free The Snake." "The groundswell that is occurring right now to remove the four dams is like nothing I've seen since 1998," said Sam Mace, director of an anti-dam group called Save Our Wild Salmon. The dams create vast reservoirs that make it possible for Lewiston, Idaho, 450 miles from the Pacific Ocean, to operate as the farthest inland seaport on the West Coast. Farmers, shipping companies and other dam supporters fiercely defend the structures as key players in the region's economy. Critics say the dams kill vast numbers of salmon and steelhead, and do not provide enough benefits to compensate for the losses of those iconic fish. A coalition of environmentalists, Indian tribes and outdoor enthusiasts want Lower Granite, Little Goose, Lower Monumental and Ice Harbor dams breached. The dams were built in the 1960s and 1970s. Migrating fish died by the thousands this summer because of higher-than-normal water temperatures in the reservoirs. In January, a petition containing more than 70,000 signatures asking to remove the dams was delivered to the Obama administration, Mace said. Those who want the dams removed argue that they harm fish and disrupt the food chain for larger species. Young fish have trouble negotiating the reservoirs and can get lost and die. Longer spawning journeys also leave fish exhausted and depleted when they finally reach the ocean. Killer whales in the Pacific Ocean depend on chinook salmon as a mainstay of their diets, and would be helped if the dams were breached, said Deborah Giles of the Southern Resident Killer Whale Chinook Salmon Initiative. Meanwhile, central Idaho communities that depend on tourism would benefit if the dams were removed, as fishing seasons would expand, dam opponents say. Opponents contend that the shipping traffic made possible by the dams is in sharp decline and that the hydropower produced by the dams can be replaced with alternative energy resources. The effort to remove the dams was stymied during the administration of President George W. Bush, who visited Eastern Washington to declare that the dams would not be removed under his watch. "These dams were boondoggles when they were built and they are even more so today," Mace said. The four dams have plenty of supporters, said Kristin Meira, director of the Pacific Northwest Waterways Association in Portland, Oregon. In 2012, 10 percent of all U.S. wheat exports moved through the Snake River dams, she said. "During the peak fall transportation season, barges and cruise ships can be seen alongside salmon fishermen throughout the Columbia and Snake River System," David Doeringsfeld, manager of the Port of Lewiston, said. Bill Flory, a wheat farmer in Lewiston, said the dams are a vital part of his business. "The dams give me the ability to load my grain in Lewiston, and I know without question that four days later it will have been loaded on a ship in Portland, ready for export," Flory said. A tugboat pushing four barges is moving 400,000 to 480,000 bushels of wheat, dam supporters say. It would take some 538 semi-trucks or 140 rail cars to move the same amount. Dam supporters also contend that salmon runs are recovering. The Snake River dams are equipped with sophisticated fish ladders that allow returning salmon to reach spawning grounds. "We're seeing more salmon in the Columbia and Snake Rivers than before Bonneville Dam was put in place," Meira said. In addition, the four dams produce enough electricity to power a city the size of Seattle, said Terry Flores of Northwest RiverPartners, a pro-dam group. It would take two nuclear, three coal-fired or six gas-fired power plants to replace that power, according to the U.S. Army Corps of Engineers, which operates the dams. Lt. Col. Tim Vail, commander of the Walla Walla District of the corps, said the dams cost $62 million per year to operate, while producing more than $200 million worth of electricity. "We will continue to ensure the Snake River dams provide outstanding value to the nation," Vail said. Here's a statement from Lt. Col. Tim Vail, Commander of the U.S. Army Corps of Engineers, Walla Walla District, who contends that Snake River dams provide outstanding value.